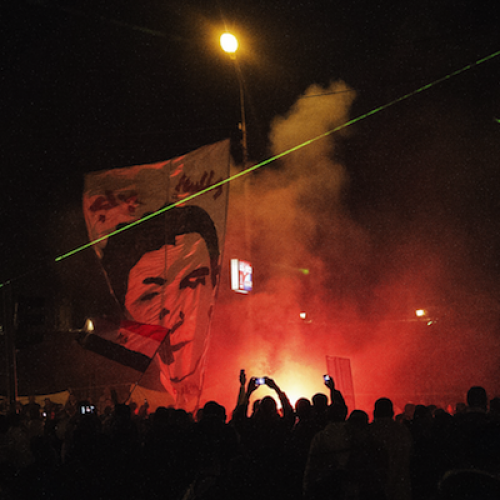 Is Egypt's Political Rift Beyond Repair? Last night, the scene in front of Rabaa Al-Adawiya mosque in Cairo's Nasr City felt like an enormous Islamist block party. A six-lane boulevard had been shut down and was crammed with thousands of bodies supporting President Mohammed Morsi. They waved Egyptian flags with religious slogans like “There is no God but God and Mohammed is his messenger,” while eating popcorn and drinking tea. The pro-government protesters had erected a stage, and when I got there as the sun set, the loudspeakers were blaring. “In Egypt, there is no war between the people,” the voice on the microphone called out, instructing the gathered to stay peaceful, praising the good judges, the good media and the good president. It was one side of the increasingly polarized narrative gripping the country. Meshawy isn’t alone in demonizing his opponents. As Egypt approaches the second anniversary of the Jan. 25 uprising, politics in Cairo has become a culture of polarized extremes and escalating street demonstrations. Factions continue to try to gain political power by seizing it through decree or walking out of the political process. Both sides consistently vilify their opponents, and the rift between political forces seems beyond repair. It’s a long way from two years ago, when disparate social movement composed of liberals and Islamists together defied one of the most powerful security apparatus’s in the Middle East by taking to the streets—and staying there. Now, even though circumstances have changed, the tactics remain the same. Many liberals boycotted parliamentary and presidential elections under the military caretaker government, calling the elections a sham and trying in vain to launch a national campaign of civil disobedience to stymie the process without offering a unified concrete alternative. Those who did run were unable to create competitive coalitions, falling apart due to internal rivalries or competing visions for the future. Meanwhile, the Brotherhood, after winning those elections, has repeatedly attempted to grab more power without engaging the opposition or holding any legitimate national dialogue over critical transition issues—from tax increases to the country’s new constitution. The most recent example of these extremist tactics prompted the last two and a half weeks of upheaval here in which at least seven people have been killed in street brawls and hundreds more have been injured. On Nov. 22, Morsi gave himself extra-judicial powers, which he has since rescinded, while the Muslim Brotherhood and its allies hastily finished writing a new constitution without the input of other social groups. Liberals and Coptic Church officials had walked out of the constituent assembly in protest of the Islamist agenda. Each side accused the other of trying to thwart the democratic transition. As the situation spiraled, Brotherhood supporters attacked opposition protesters encamped in front of the presidential palace last Wednesday night. The following night, Morsi addressed the nation and blamed shadowy infiltrators paid by third parties for street violence. He set a national referendum for this Saturday to vote on the new constitution without addressing opposition and human rights groups’ claims that the new constitution does little to protect minorities, women and the press, telling them to take their issues to the ballot box—a place they are notoriously weak. The opposition continued to struggle between boycotting the entire referendum and trying to launch a campaign to vote “no.” Today, the National Front for Salvation decided they would participate in the referendum, but also threatened to call for a last minute boycott on Saturday morning if their conditions, including full judicial supervision, adequate security of polling stations, and independent monitoring, were not met. Their leadership told the media they would continue to fight against the draft if the Islamist-backed constitution indeed passed in the polls. “The real root of the tension in Egypt is the lopsided distribution of power among the country's political forces,” Marina Ottoway, senior associate in the Middle East Program of the Carnegie Endowment for International Peace, wrote in Foreign Affairs. Seculars have been crushed in every vote since Mubarak. “Under these circumstances, Islamist forces want to accelerate the return to formal democratic politics, because they can win. Secular forces cannot afford to play that game. Going forward, the question is not about who is more committed to a democratic outcome in Egypt but about who can gain power in the short run, and by what means,” she continued. The shortsighted tactics have created a country and political culture where both sides of the spectrum seem to live in completely alternate realities. Standing with a group of friends, Hisham Amr seemed lost. “I don’t see a difference between Hosni Mubarak and Morsi—I feel like my country was taken from me, I’m not convinced by the constitution,” the 25-year-old banker told me. Amr said he wasn’t going to vote in the referendum on Saturday. “We need to bring down the regime,” he said. “Morsi should leave the country. We should put him in jail, along with all the Muslim Brotherhood. They should go back to jail where they came from.” He said he had voted in the first round of the presidential election before nullifying his ballot in the run-off. That night, the gridlock continued. Egypt’s main association of judges announced 90 percent of their members would not participate in monitoring Saturday’s referendum, while the military called for a national unity dialogue—which they postponed today due to low levels of commitment from political factions. And instead of delaying the vote, Morsi announced the referendum would take place over two weeks with different regions voting on different days in order to work around the judges’ boycott. The obstinacy has trickled down from the leadership to foot soldiers, with both sides growing further and further apart, digging into their positions. When I asked him about the pro-Brotherhood demonstration he said “They’re just followers, doing what they’ve been told to do.” Although the city braced for clashes, it turned out to be another night of sparring with words.